Rat anti Mouse CD4 antibody, clone KT15 (MCA609) used for the detection of CD8 positive lymphocytes by flow cytometry. 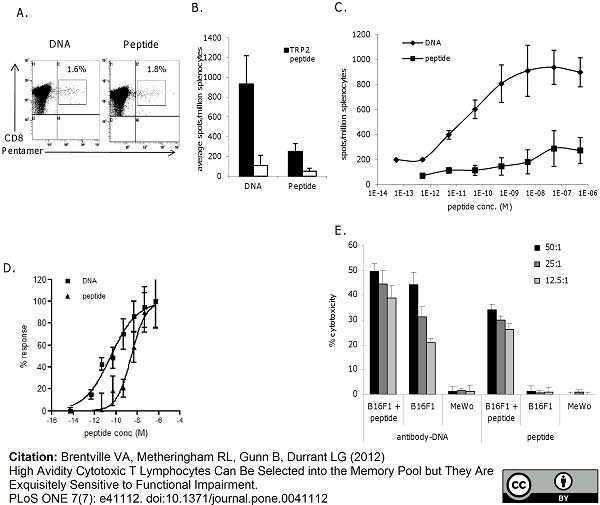 Peptide boost leads to loss of high avidity responses in vivo. A, schematic of immunization regime. Mice immunized with DNA were boosted at day 63 with DNA or peptide, or with peptide at day 42 followed by DNA at day 63. Responses were analyzed at day 70 for frequency (B) and avidity (C) by measuring responses to increasing peptide concentration in IFNγ elispot assay, D) normalization of responses to increasing peptide concentration in IFNγ elispot assay. E, Analysis of antigen specific CTL by pentamer and CD8 staining of immunized splenocytes. F, Analysis of memory phenotype of antigen specific CTL by combination staining for CD62L and CD127 markers. Data is representative of at least three independent experiments. From: Brentville VA, Metheringham RL, Gunn B, Durrant LG (2012) High Avidity Cytotoxic T Lymphocytes Can Be Selected into the Memory Pool but They Are Exquisitely Sensitive to Functional Impairment. PLoS ONE 7(7): e41112. Figure A. FITC conjugated rat anti mouse CD4 (MCA2691F) and Alexa647® conjugated Rat IgG2b isotype control (MCA1212A647). Figure B. FITC conjugated rat anti mouse CD4 (MCA2691F) and Alexa647® conjugated rat anti mouse CD8 alpha (MCA609A647). All experiments performed on murine splenocytes in the presence of murine SeroBlock (BUF041A). Figure A. A647 conjugated rat anti mouse CD3 (MCA500A647) and A488 conjugated rat IgG2a isotype control (MCA6005A488) Figure B. A647 conjugated rat anti mouse CD3 (MCA500A647) and A488 conjugated rat anti mouse CD8a (MCA609A488). All experiments performed on red cell lysed murine splenocytes gated on mononuclear cells. Data acquired on the ZE5™ cell analyzer. Rat anti Mouse CD8α antibody, clone KT15 used for the detection of CD8 positive lymphocytes in a mouse model of colorectal liver metastasis by immunohistochemistry and immunofluorescence on acetone treated liver cryosections. 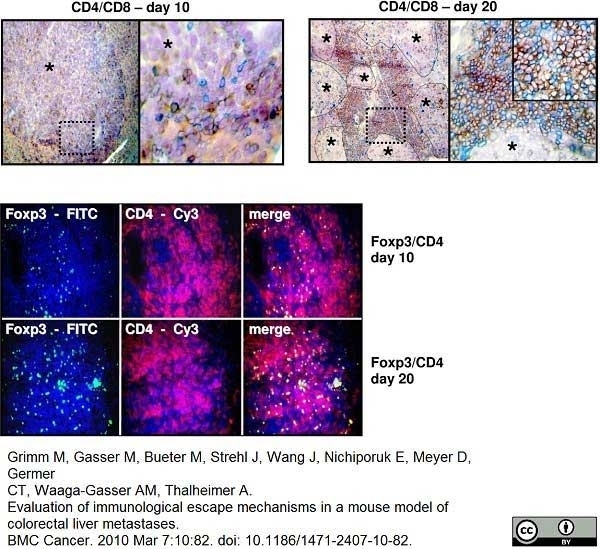 (a) Immunohistochemistry and (b) immunofluorescence double staining: Representative image of CD4 (red)/CD8 (blue) (top) expression and Foxp3 (FITC)/CD4 (Cy3) (bottom) expression in liver metastases on day 10 (n = 7) compared to increased CD4 (red)/CD8 (blue) expression and Foxp3 (FITC)/CD4 (Cy3) expression on day 20. Immunohistochemistry: Nova red brick red color, Vector Blue blue color. Haemalaun blue color-nuclear counterstaining. Asterisk with indication lines show metastases next to normal tissue (×100 and ×400). Immunofluorescence: FITC green fluorescein isothiocyanate, Cy3 red and DAPI 4′,6-diamidino-2-phenylindole blue - nuclear counterstaining (×250). From: Grimm M, Gasser M, Bueter M, Strehl J, Wang J, Nichiporuk E, Meyer D, Germer CT, Waaga-Gasser AM, Thalheimer A. 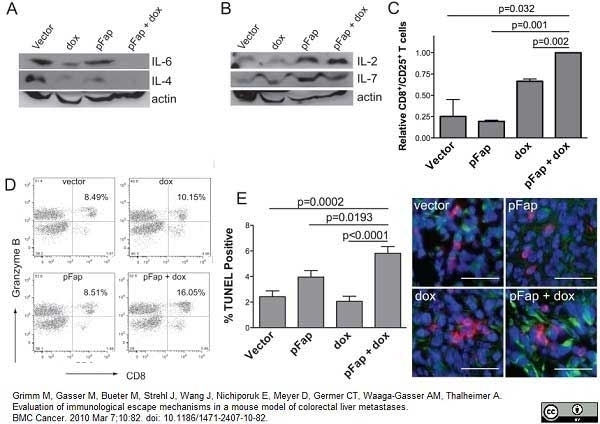 Evaluation of immunological escape mechanisms in a mouse model of colorectal liver metastases. BMC Cancer. 2010 Mar 7;10:82. Rat anti Mouse CD8α antibody, clone KT15 used for the detection of CD8 positive lymphocytes in a mouse model of colorectal liver metastasis by immunofluorescence on acetone treated liver cryosections. Immunofluorescence: Representative images of increased CD8+/FAS (a) and CD8+/TUNEL (b) expression on tumor infiltrating lymphocytes at the margin of liver metastases on day 20. FITC green Fluorescein isothiocyanate, Cy3 red and DAPI 4′,6-Diamidino-2-phenylindoldihydrochlorid blue - nuclear countersaining. 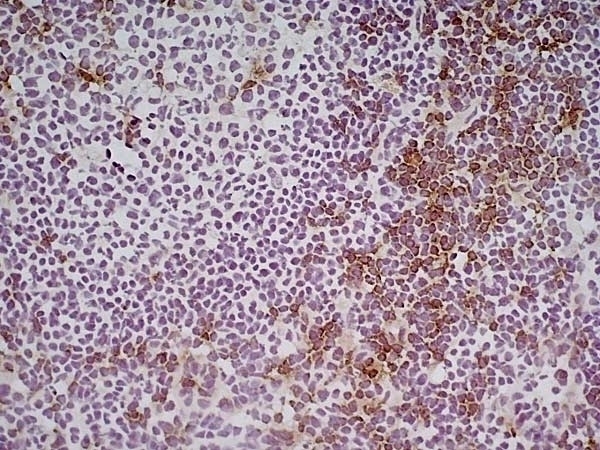 Case demonstrates area of the TUNEL staining in serial cryostat sections. To adjust a better contrast TUNEL stained sections were not counterstained with DAPI. Asterisk with indication line shows metastatic tumor cells. Magnifications ×250 (top) and ×400 (bottom). Rat anti Mouse CD8α antibody, clone KT15 use for the detection of CD8 positive T cells from tumors by flow cytometry and immunofluorescence. Vaccination with pFap suppresses TAM, MDSC, Treg, and enhances DC and CTL recruitment. Primary tumors were isolated from mice 25 days after orthotopic challenge and immune cells were identified in primary tumors using antibodies for the following: (A) tumor-associated macrophages (TAMs): F4/80 (red), (B) myeloid derived suppressor cells (MDSCs): CD11b (red, nuclear) and Gr-1 (green, nuclear), (C) T regulatory cells (Tregs, white arrowheads): CD4 (red, cell surface) and FOXP3 (green, nuclear), (D) dendritic cells (DC): 33D1 (red), and (E) cytotoxic T lymphocytes (CTL): CD8 (red) Scale bar for all panels=100 μm. From: Liao D, Luo Y, Markowitz D, Xiang R, Reisfeld RA (2009) Cancer Associated Fibroblasts Promote Tumor Growth and Metastasis by Modulating the Tumor Immune Microenvironment in a 4T1 Murine Breast Cancer Model. PLoS ONE 4(11): e7965. Rat anti Mouse CD8α antibody, clone KT15 used for the detection of CD8 positive lymphocytes by flow cytometry. sIM-1.6.α induces enduring CD4 and CD8 T cells memory response. Mice were immunized and aerosol challenged as mentioned in Figure 1. 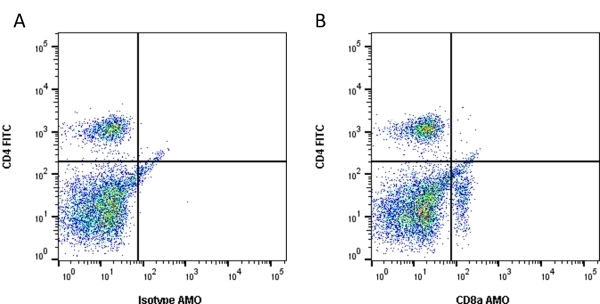 Lymphocytes were stimulated in vitro with PPD (50 μ:g/ml) for 48 h and later stained with fluorochrome conjugated antibodies and analyzed by flowcytometry. A, flow contours depict percentage of gated CD4 T cells expressing IL-7R and CD44 (upper panel); CD62L on CD4 T cells (lower panel). 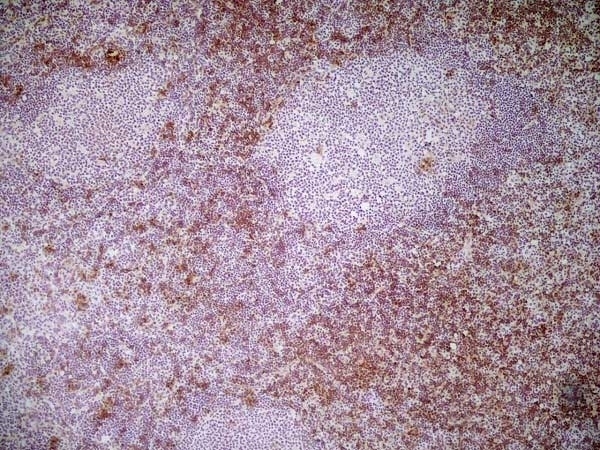 C, gated CD8 T cells expressing IL-7R and CD44 (upper panel) and CD62L on CD8 T cells (lower panel). Bar diagrams show total number of CD4 (B) and CD8 (D) T cells expressing CD44hi, CD62Lhi and CD62Llo. Data shown are mean ± SEM of two independent experiments with n = 3 animals per group. "*" and "**" indicate p<0.05 and p<0.01 respectively. From: Singh V, Jain S, Gowthaman U, Parihar P, Gupta P, et al. (2011) Co-Administration of IL-1+IL-6+TNF-α with Mycobacterium tuberculosis Infected Macrophages Vaccine Induces Better Protective T Cell Memory than BCG. PLoS ONE 6(1): e16097. Vaccination with xIM-1.6.α induces CD4 and CD8 T cells memory response. Mice were immunized and aerosol challenged as mentioned in Figure 1. 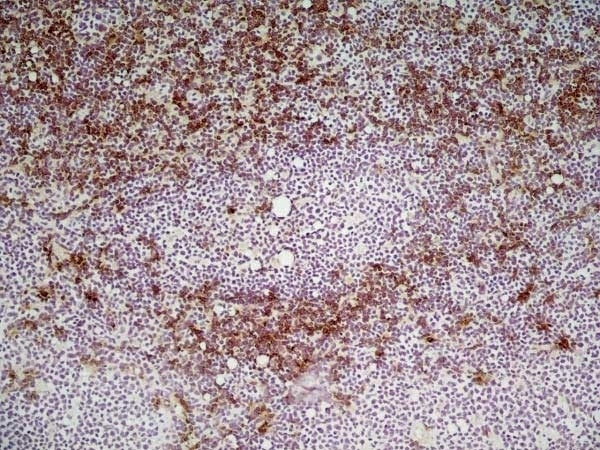 Pooled lymphocytes from spleen and lymphnodes of immunized animals were stimulated in vitro with PPD (50 μg/ml) for 48 h and later stained with fluorochrome tagged antibodies and analyzed by flowcytometry. A, flow contours depict percentage of CD4 T cells expressing IL-7R and CD44 (upper panel); CD62L expression on CD4 T cells (lower panel). 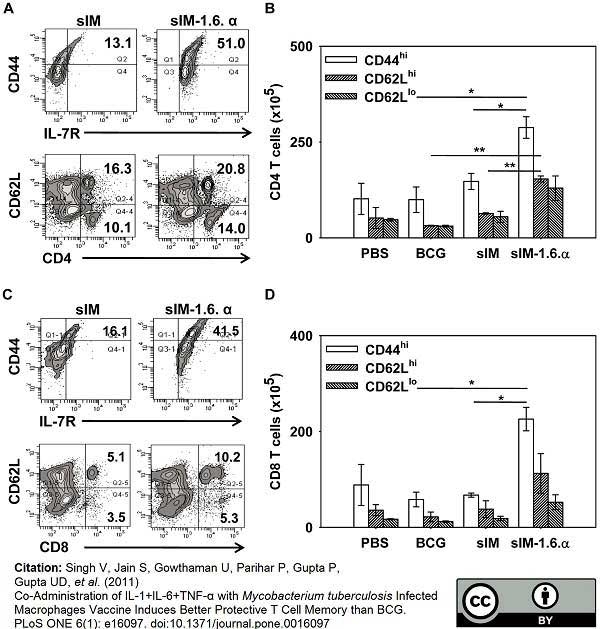 C, CD8 T cells expressing IL-7R and CD44 (upper panel); CD62L on CD8 T cells (lower panel). Bar diagrams show total number of CD4 (B) and CD8 (D) T cells expressing CD44hi, CD62Lhi and CD62Llo. Data shown are mean ± SEM of two independent experiments with n = 3 animals per group. "*" indicates p<0.05. Rat anti Mouse CD4 antibody, clone KT15 used for the detection of CD8 positive lymphocytes by flow cytometry. Peptide immunization induces low avidity functionally impaired CTL. Splenocytes from mice immunized with peptide or DNA were analyzed at day 20 for A, Presence of antigen specific CTL by pentamer and CD8 staining. B, Frequency of epitope specific responses in IFNγ elispot assay C, Avidity and frequency of epitope specific responses by measuring responses to increasing peptide concentration in IFNγ elispot assay, D, Analysis of the avidity by normalization of responses. E, The ability of CTL lines to lyse tumor cells in chromium release assay. Data is representative of at least three independent experiments. Rat anti mouse CD8α, clone KT15, recognizes the alpha chain of mouse CD8. CD8 is a heterodimeric protein composed of disulphide-linked CD8α and CD8β chains that is expressed primarily on cytotoxic T-cells. 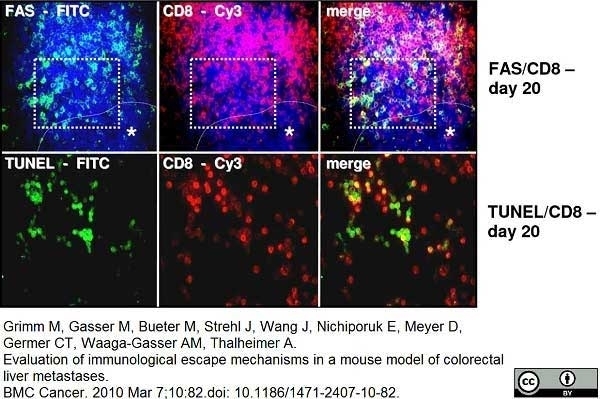 CD8 functions in the interaction with MHC Class I-bearing targets and plays a role in T-cell-mediated killing (Nakauchi , H. et al., 1985 & Nakauchi, H. et al., 1987). Clone KT15 is reported to block T-cell-mediated cytotoxicity in in vitro assays (Zeis, M. et al., 2002). The Fc region of monoclonal antibodies may bind non-specifically to cells expressing low affinity Fc receptors. This may be reduced by using SeroBlock FcR (BUF041A/B/C). Tomonari, K. & Lovering, E. (1988) T-cell receptor-specific monoclonal antibodies against a V beta 11-positive mouse T-cell clone. Whiteland, J.L. et al. (1995) Immunohistochemical detection of T-cell subsets and other leukocytes in paraffin-embedded rat and mouse tissues with monoclonal antibodies. J Histochem Cytochem. 43 (3): 313-20. Lee, Y.L. et al (2003) Oral administration of Agaricus blazei (H1 strain) inhibited tumor growth in a sarcoma 180 inoculation model. Eller, K. et al. (2011) IL-9 production by regulatory T cells recruits mast cells that are essential for regulatory T cell-induced immune suppression. Grimm, M. et al. (2010) Evaluation of immunological escape mechanisms in a mouse model of colorectal liver metastases. Moos, M.P. et al. (2005) The lamina adventitia is the major site of immune cell accumulation in standard chow-fed apolipoprotein E-deficient mice. Arterioscler Thromb Vasc Biol. 25: 2386-91. Stevenson, P.G. et al. (2002) Uncoupling of virus-induced inflammation and anti-viral immunity in the brain parenchyma. J Gen Virol. 83: 1735-43. Wang, X. et al. 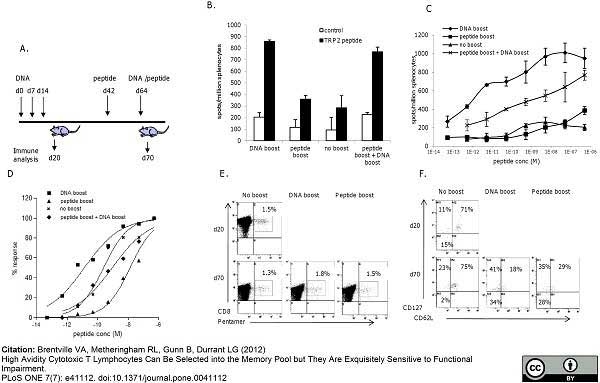 (2011) Quercetin and Bornyl Acetate Regulate T-Lymphocyte Subsets and INF-γ/IL-4 Ratio In Utero in Pregnant Mice. Evid Based Complement Alternat Med. 2011: 745262. Zeis, M. et al. (2002) Idiotype protein-pulsed dendritic cells produce strong anti-myeloma effects after syngeneic stem cell transplantation in mice. Bone Marrow Transplant. 29: 213-21. Ideguchi, M. et al. (2008) Immune or inflammatory response by the host brain suppresses neuronal differentiation of transplanted ES cell-derived neural precursor cells. J Neurosci Res. 86: 1936-43. Wolf, D. et al. (2005) CD4+CD25+ regulatory T cells inhibit experimental anti-glomerular basement membrane glomerulonephritis in mice. J Am Soc Nephrol. 16: 1360-70. Severinova, J. et al. (2005) Co-inoculation of Borrelia afzelii with tick salivary gland extract influences distribution of immunocompetent cells in the skin and lymph nodes of mice. Folia Microbiol (Praha). 50: 457-63. Zaini, J. et al. (2007) OX40 ligand expressed by DCs costimulates NKT and CD4+ Th cell antitumor immunity in mice. J Clin Invest. 117: 3330-8. Meyer, C. et al. (2011) Chronic inflammation promotes myeloid-derived suppressor cell activation blocking antitumor immunity in transgenic mouse melanoma model. Proc Natl Acad Sci U S A. 108: 17111-6. Zitt, E. et al. (2011) The selective mineralocorticoid receptor antagonist eplerenone is protective in mild anti-GBM glomeru-lonephritis. Int J Clin Exp Pathol. 4:606-15. Singh, V. et al. (2011) Co-administration of IL-1+IL-6+TNF-α with Mycobacterium tuberculosis infected macrophages vaccine induces better protective T cell memory than BCG. Kalyanasundaram Bhanumathy, K. et al. 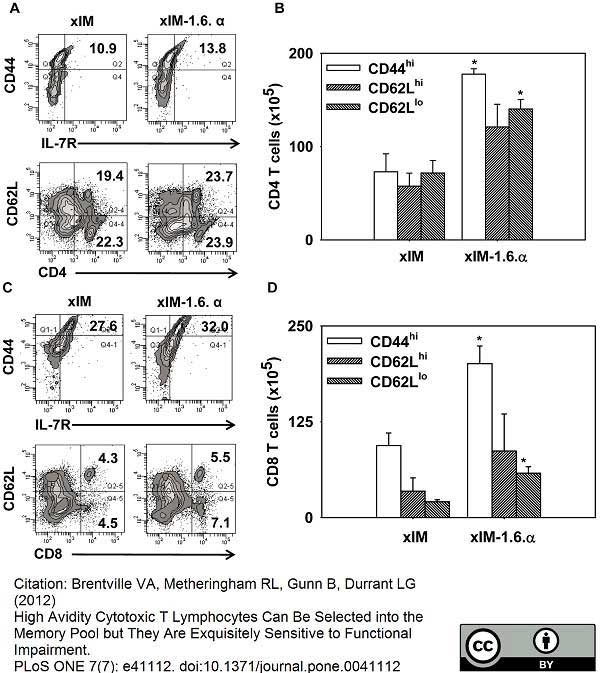 (2015) Potent immunotherapy against well-established thymoma using adoptively transferred transgene IL-6-engineered dendritic cell-stimulated CD8(+) T-cells with prolonged survival and enhanced cytotoxicity. J Gene Med. 17 (8-9): 153-60. Abiko K et al. (2015) IFN-γ from lymphocytes induces PD-L1 expression and promotes progression of ovarian cancer. Br J Cancer. 112 (9): 1501-9. Phan-Lai, V. et al. (2016) The Antitumor Efficacy of IL2/IL21-Cultured Polyfunctional Neu-Specific T Cells Is TNFα/IL17 Dependent. Clin Cancer Res. 22 (9): 2207-16. Kajiwara, T. et al. (2016) Hypoxia augments MHC class I antigen presentation via facilitation of ERO1-α-mediated oxidative folding in murine tumor cells. Srivastava, A.K. et al. (2016) Co-transplantation of syngeneic mesenchymal stem cells improves survival of allogeneic glial-restricted precursors in mouse brain. Exp Neurol. 275 Pt 1: 154-61.